DeAnn's living room after transom installation. One of DeAnn's Transoms in outside light. 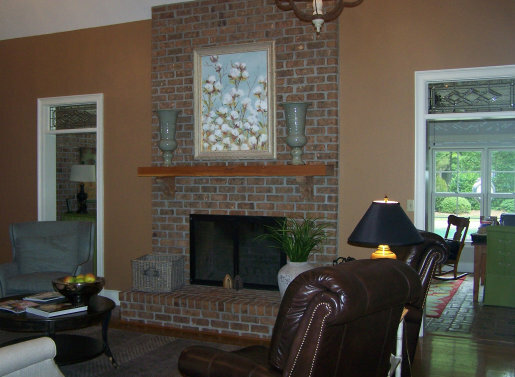 DeAnn contacted me about building a set of two identical transoms for her home in Americus, Georgia. She had two doors with transom openings leading into a sunroom from her living room. DeAnn & I discussed a number of possibilities by phone. She liked several transoms from my website that had central bevel sets with bevel borders. She wanted a clear waterglass background and a band of clear patterned glass to contrast. Our challange was to find a small bevel set that would work in the 12" x 32" dimensions that we had to work with. We both searched the web for bevel sets. DeAnn discovered a bevel set she really liked made by Mika (pictured to the right) that was only 6.25" x 21", just the perfect size for our design. I ordered two of the bevel sets and when they came in, I laid out all the bevels so we could get a perspective of how our transoms would work before assembly. After installation, DeAnn's Transoms look like they were installed when the home was originally built! DeAnn's Transoms were completed in March of 2015. Each transom contains 61 pieces of glass and measures approximately 12" x 32". They are now enjoying their new home in Americus, Ga.
To the right is one of DeAnn's finished transoms. Notice, with 41 pieces of beveled glass and 4 jewels, how the light coming through the transom is reflected in many directions. Beveled transoms are particular beautiful in areas where light, particularly sunlight, can shine through the bevels and create a rainbow effect. 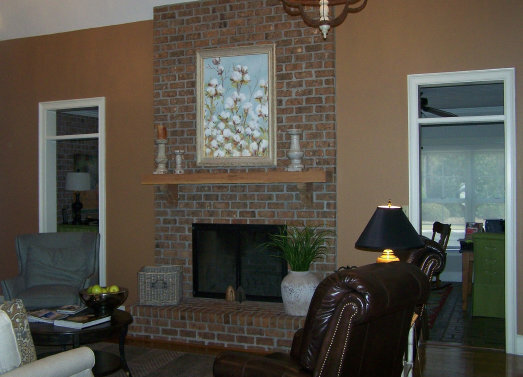 DeAnn was kind enough to send photos of her living room before and after installation. DeAnn was wonderful to work with because she knew exactly what she liked. She joined in the search for a bevel set and found exactly what she wanted... and was decisive enough in the design process to make my job easier! After installation photo of DeAnn's transoms.